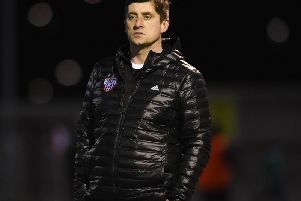 DECLAN Devine believes he’s got the perfect team behind him to help take Derry City back to where it belongs at ‘the top end of Irish football’. The passionate Creggan man is ‘honoured’ to return to the Brandywell hotseat for a second stint on a two-year deal with a backroom team who have Derry City ‘running through their veins’. Former Derry City skipper and ex-Institute manager, Kevin Deery has been appointed Devine’s assistant with ex-Candy Stripes’ midfielder, Martin McCann returning to Brandywell as a first team coach. Derry City’s newly appointed Head of Development, Paddy McCourt will also form a significant part of the club’s backroom team - a team Devine believes is the perfect blend to bring a pride and an identity back to the club. “I’ve been involved in the club for a large chunk of my life as a player, a coach, assistant manager and a manager and I’m honoured and privileged to come back in again,” said Devine who was officially unveiled at a press conference in Bishop’s Gate Hotel last night. “To manage Derry City is a privilege. I’ve been fortunate that this is my second opportunity to manage Derry City and I’m proud of that. Declan Devine pictured with the FAI Cup in 2012. Devine, who won the FAI Cup in 2012 in his first season as manager, was shown the door by the Derry City Board at the end of the 2013 campaign. However, he hasn’t returned to prove a point. Nor is it a case of unfinished business. It is, as he puts it, “simply too good to turn down”. “Obviously I left the club five years ago and I take responsibility in that myself but I’ve matured as a manager, I’ve matured as a man. My life is in a much better place in terms of where I am with my family life, work life and experience. “I had opportunities to manage other football clubs. I wasn’t interested. I love Derry City Football Club, always have and always will. “What happened in the past is what it is. I take full responsibility in terms of leaving the club. I’m a better person for it now. I don’t want to dwell on the past. I don’t have a point to prove. All I want to do is to work with others to get Derry City back to where it needs to be. “I’m not going back in for sentiment. I have a brilliant backroom team with Kevin Deery as my No. 2, Marty McCann, Paddy McCourt - they’re the type of people who have Derry City running through their veins. “We’re not coming in with any egos. We’re coming in with a working mentality in terms of getting this club right and back to where it should be. “It has good people, talented people and people who know, not only the football team, but the city. Everybody I have brought in with me is a winner. They’ve all won trophies during their career. They’ve all had success and all loved playing for Derry City Football Club. There’s no getting away with the fact Devine and his team face a daunting challenge to resurrect the club’s fortunes after finishing seventh in a 10 team league last season. With just a handful of players under contract for the 2019 season and having lost the quality of Rory Hale (Crusaders) and Nicky Low in the close season, the club needs a major face-lift. So what would Devine define as a successful season in his first season at the helm, bearing in mind the major rebuilding job he faces on a reduced budget. Change is needed at the club and Devine certainly isn’t going to shirk that challenge. “As a Derry City fan and a Derry man, I’m ready for this challenge. I’ve brilliant people around me, both at home and in my backroom team. I’m comfortable and confident working with the Chairman and his board of directors. Devine has been working as a youth coach in the elite performance Club NI scheme with the IFA for the past five years since his departure from Brandywell. And while he’s been out of senior management during that time, he’s been working as a pundit for RTE’s Soccer Republic and has a wealth of knowledge in the local game. “I’m leaving a job that I’ve enjoyed doing and had a lot of success with over the last five years but when the opportunity to manage Derry City comes along you just don’t turn it down. “I think everyone in this city knows there’s a lot of work to be done. Recruitment becomes hugely important but I have a backroom team with me whom I trust with all my heart and we’re all going to try to make sure we get Derry City back to the top end of Irish football. “It’s about Derry City Football Club, it’s not about Declan Devine or any individual. It’s about getting the club back to where it belongs. I’d like to think I’ve had a huge impact at Derry City Football since 2002 when I first went there as a coach in terms of knowing players, knowing how the club works and also knowing how to be successful. “There is no magic formula, it’s going to be hard work and it’s going to take time.